Family Fun with the Boivies: Money, Money, Money!! We decided to start giving the kids a small allowance and to start teaching them about money. (This was prompted by a major meltdown in Target one day after we refused to buy Rhianna a High School Musical journal making kit.). We told the kids we were going to start giving them an allowance and that our family home evening was going to be about money. I decided to teach the lesson. It was interesting preparing to teach my kids about money. I know a lot about personal finance and money management, but it was hard to figure out how to talk about money with a 5 year old and a 3 year old. Here is what we decided. We decided to give them an allowance of $1 for every year old. We first went over some principles about money. 1. You never have enough money to get everything you want. 2. Because you don’t have enough to get everything you want, you need to really think about how to spend your money. 3. All of the things we have come from Heavenly Father and we should be grateful for them. How to use our money based on the 3 principals. 1. Save your money so that you can get the things you really want. 2. Because everything we have comes from Heavenly Father, we show our gratitude by paying our tithing. We gave them each a little bank where they could store their money. We also gave them an option of putting their money in “Dad’s Bank”. Dad’s Bank pays interest, but if they put their money in there, they can’t have it for at least a month. Rhianna chose to put $2 in Dad’s Bank. (Dad’s Bank pays a very generous 12% interest per year). We had stake conference last week, so this week was the first week where they could pay their tithing. 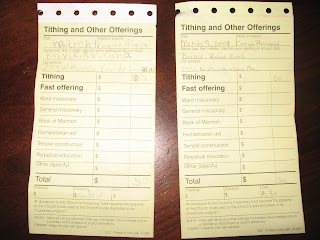 We got to church a little early and they each got a tithing envelope and donation slip. I helped Rhianna with hers, and Steph helped Rand. After Rhianna got back to the bench after giving her tithing she said: “That made me feel really good inside.” I then asked: “Do you know what is making you feel that way?” She said: “The Holy Ghost.” She then spent the rest of sacrament meeting “practicing” paying tithing. That meant she was copying out all of the things on a donation slip onto a piece of paper. I feel blessed to have a wonderful family and such wonderful kids. I am glad we took the meltdown as a teaching opportunity, and it was really great to see Rhianna's face after she paid her tithing. Plus, now whenever she sees something she wants she says: "Maybe I will save up for that and buy it." what a great idea! i do have to say that if dad's bank pays 12%, can I join? Only if you deposit just $2 per month...we can afford to pay interest on that since it is just 24 cents a year. You guys are such good parents. Andrew knows what money is because any time he asks for something I tell him I don't have money (meaning cash). So now instead of asking for me to buy him something he says "Mommy no money." Anyhow, sounds like a great lesson and great kids too.